Hit the Trail with Marin Mommies! 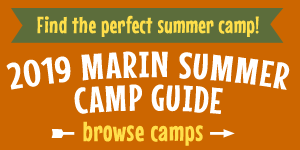 Marin County is a paradise for families who love the outdoors, with Point Reyes National Seashore, Mt. Tamalpais State Park, Angel Island, the Golden Gate National Recreation Area, and more right in out own backyard. Find family-friendly hikes, walks, beaches, camping spots, and more outdoor activities, ideas and resources. Tolay Lake Regional Park near Petaluma is a fantastic place for a family hike, with miles of trails, wildlife, friendly farm animals, and more. It's now open daily.